The revisions and additions accumulated over several years have been incorporated into a new RV-C specification document. The new document includes all updates as of December 15, 2015. It is available for free download on this site. Simply click on "RV-C Specification" on the left side of this page. 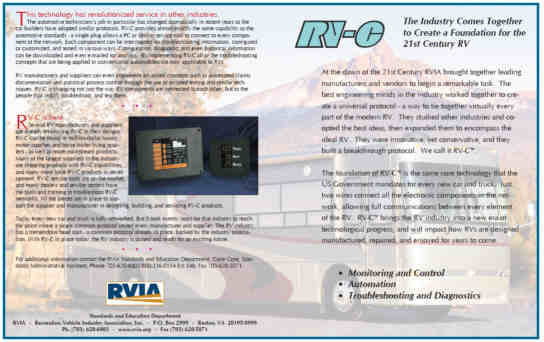 RV-C was the focus of a booth at the 2010 RVIA National Show. The booth included a live demonstration of operation and diagnostics of an RV-C system, and a video that outlined the benefits of RV-C for manufacturers, suppliers, and technicians. The video and presentation outline are available for download to members of the media at http://www2.silverleafelectronics.com/temp/RV-C Media Files.zip. The video is copyrighted by the RVIA and is provided as background information only. Any public use of the video must be approved by the RVIA Technical Subcommittee on Multiplexing. The VDX 404 Video Switch is now available. This unit accepts up to four NTSC video sources, and routes them to up to four video monitors. Any signal can be routed to any monitor without limitation - for example, one signal can be routed to all four monitors simultaneously, making the unit into a 4:1 splitter. The switching can be controlled by up to 12 external switches, such as blinker signals or rocker switches. The unit can also read the RV-C or SAE J1939 data bus to detect when the vehicle is in Reverse gear. And the unit can be controlled via RV-C.
All output signals are conditioned and buffered. No other hardware is required for a full-featured, high-quality system. The unit is configured using RV-C and the Omniscope tool. The typical application is for routing rear and side cameras to multiple dash monitors. The unit easily manages the switching of signals according to whether the RV is in reverse or the blinkers are active. Other applications include switching GPS displays to multiple monitors and routing camera signals to the main televisions for security purposes. The RVIA is sponsoring a milestone event in the history of RV-C. The National Trade Show in Louisville KY will be the site of the "RV-C Network Fest" - a live demonstration of RV-C networking featuring over 15 vendors and their products. The Fest will be held in Room C101 in the South Wing over all three days of the RVIA show - November 27th through 29th. The demonstration will include two big-screen television, each displaying control and diagnostic activity on the network. At the time of this post the participant list includes Aqua-Hot, Atwood, Carefree of Colorado, Cequent, Faria Instruments, Freightliner Customer Chassis, Girard, HWH Corp., Intellitec, International Thermal Research, PowerTech, SilverLeaf Electronics, Spartan Motors, Technology Research Corp., Trimark, and Vansco. Admission is free to anyone with an RVIA show badge. For more information on attending the RVIA National Trade Show contact Doreen Cashion (dcashion@rvia.org). One of the virtues of RV-C is that it allows us unlimited latitude in designing the user experience. The best example we can offer is the HMStv. This unique device uses a simple IR Remote Control to allows the user to control every feature of the RV-C network. And it provides a spectacular NTSC television output to let the user monitor his system on any television. The HMStv is easier to use and more impressive than the proprietary systems used in million-dollar bus conversions, but at a small fraction of the cost. SilverLeaf will custom-program the HMStv for the specific coach application. 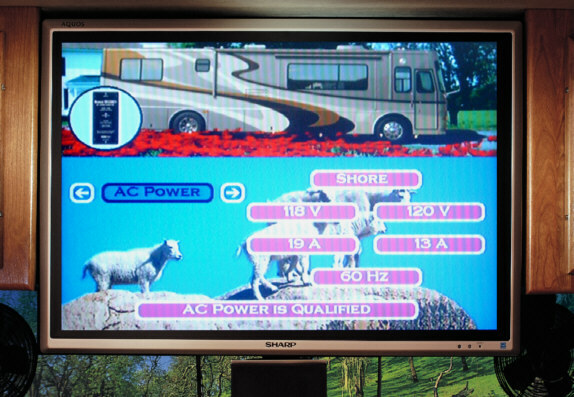 The background artwork is field-upgradable, which means that individual RV owners can further customize their systems. HMStv is comes with an easy-to-use remote, and is compatible with almost all universal remote controls.